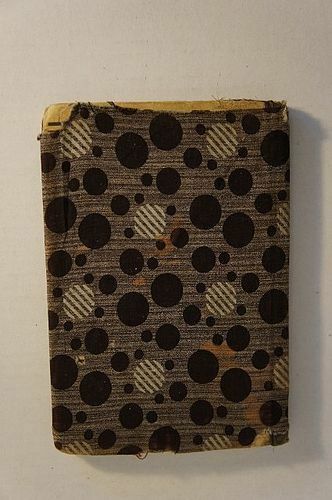 Early brown calico fabric covered school book. It reminds me of the song, Blowing Bubbles. It is a happy book. It was printed in NY and it is an early Reading Speller. Nice penmanship on the inside. Mr. Elias G Wiesner, Stines Corner Henry L Scheetz Teacher It is 5" by 7 1/2"
Antique cloth covered book brown calico fabric Calico covered school book dark blue and red Brown and white ditty bag with drawstring top 19th C.